Forget his helicopter and his multimillion dollar Manhattan loft—the coolest thing about Sam Ovens is his webinar funnel. For those who don’t know, Sam is a consultant who went from working in his parents’ garage to making $20M in 4 years (Consulting.com). His is the type of sensationalized Facebook headline you see in your newsfeed and immediately discredit but can’t help clicking anyway because, y’know, you’re sitting on the toilet and it’s better than watching another video of your cousin’s children running around Chuck E. Cheese. Then you start clicking around. And his multimillion-dollar apartment appears to be real and not some questionably Photoshopped studio set that he rented out for an afternoon video shoot. Say what you want about his accelerator program—plenty of people have both positive and not-so-positive reviews—but that’s not what I want to talk about. I want to talk about his crazy good sales funnel. I think Sam is a shining example of smart marketing combined with great sales acumen. How much money does he actually make? I’m not sure, but this is how he does it. The Sam Ovens funnel is a complete loop. It starts with social ads, progresses through registration, triggers a series of welcome and reminder emails, and ends with a CTA back to the webinar registration page. Sam’s not-so-secret weapon is that he’s a great copywriter. All of his ads take full advantage of his rags-to-riches personal story. They incite interest, inspire the audience, and spark action with a desirable promised land. And they’re LONG. Not quite “broetry” style, but they pack a punch and get readers invested long before they click the first CTA. You can guess these ads work especially well with consultants, right? He’s selling the dream. Private jets, BFFs with Tai Lopez, $20M in four years. If the audience believes he’s the real deal, they’re already drooling. That’s why authority and social proof are key at this stage. Guaranteed the first thing people do after reading a Sam Ovens ad is click around to see if he’s the real deal. There are so many phonies out there that your brand has to be believable across search and social. If it’s not, the whole thing falls apart. 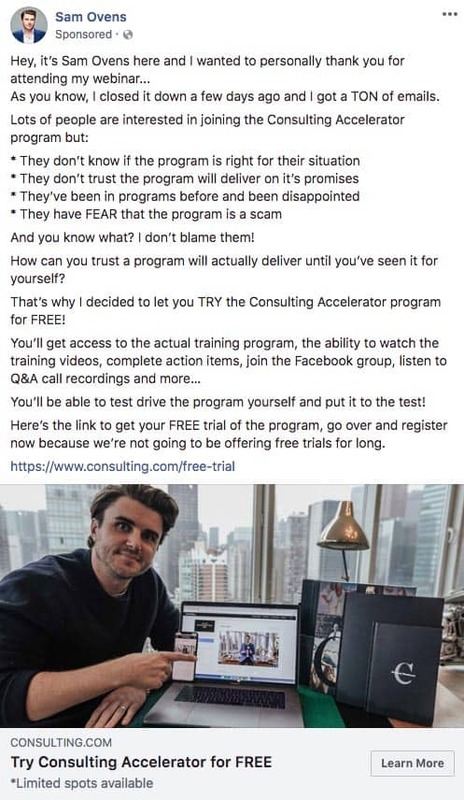 For this reason, I put a dotted line from Sam’s Facebook ads to his Facebook page and Search at the start of the funnel diagram. Just like his Facebook copy, Sam’s registration page lasers in on quantifiable benefits. 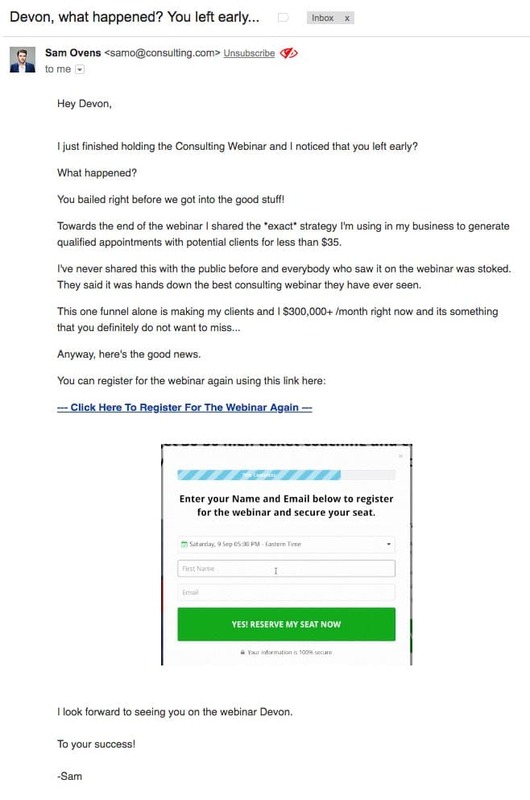 Specifically, he promises to show you how he gets 30-50 high ticket consulting clients every month. The video is good, too. Well-filmed, well-spoken. You trust that this is going to be a quality production with real benefits. Notice the call to action. He’s billing it like a live webinar, even though no one in 2018 would believe that’s actually the case. Still, it helps set the stage and gives it an air of exclusivity. When you click Yes! Reserve My Seat Now, you’re prompted to select a nearby time and date. Again, these are totally arbitrary, but they help with perceived exclusivity. The tool he’s using for webinars is WebinarJam. More on why this is important later. Once you’ve chosen your date and time, you’ll hit the success page. One more important note about the content so far: at every step, he has been emphasizing that his webinar is NOT short. He tells you to block off 2.5 hours. Yes. 2.5 hours. It’s a brilliant way to get people invested and start taking you seriously. Basically, he’s saying if you want the results he’s promising, you have to be prepared to invest time. It covers up the “get rich quick” stench and prepares you to set aside dedicated time for what he has to say. Super powerful. 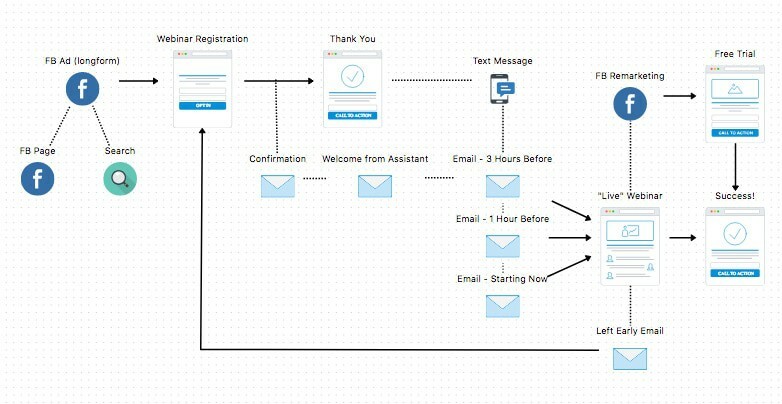 Love the calendar and SMS reminders, too, which add more steps to the funnel than I showed in the original diagram. I wouldn’t be surprised if most people add all available notifications to avoid missing their “booked slot”. Here’s an interesting one-off moment in the Sam Ovens journey. Everything you’ve heard about Sam up until this point in the funnel—and everything you’ll hear going forward—comes from Sam himself. The email following the webinar confirmation, however, comes from his assistant, Sarah. The email is reinforcing the fact that you should set aside 2 hours for the webinar. They really want your undivided attention. Now. Whether Sarah is some poor VA who had to manually make that image with my name on it or if they’re using an automated tool (more likely), Sarah herself is probably not real…I think. I only say “probably” because they’ve done a pretty good job hiding her tracks. She has a LinkedIn profile with a non-stock photo image—at least one that Google couldn’t find—and I was able to communicate back and forth with her a couple times. Sarah, if you are real, I apologize. Get some endorsements on LinkedIn or a personal site and maybe people won’t question your existence. There is no way Sam is going to let you forget about his webinar. The following are the three countdown emails you get from the webinar system prior to it starting: 3 hours before, 1 hour before, and right on time. The rest of the reminders look the same, with the subject and opening line customized per countdown time. From there, you click the link in your email and you’re off to the races. If you click into the webinar before it has started, you’ll get this screen. First impressions are that it’s a polished system. This is one of the reasons I like WebinarJam—because it’s easy to use (as opposed to so many clunky webinar platforms) and offers a lot of cool CTA options that we’ll see later. I don’t know about the ROI of a video like this, but if I had to choose between having one and not having one for my next high-ticket webinar, I’d have one. After the video is finished, the webinar begins. Let me preface the rest of this by saying Sam puts on a bloody good show. I’m not going to dig into the content itself since this is a post about funnels, but here are the slides if you’re interested. I really like how he opens the webinar, though. Since we know it’s two hours, he takes time telling his personal story to get you invested before moving onto tactics. Ok, fast forward two hours. After taking you through his tactics and strategies, now comes the ask. What is he selling, exactly? It’s the Sam Ovens Consulting Accelerator program. More likely than not, you’re shaking your laptop at this point and shouting, “But how much does it cost?? ?” Finally, after reiterating the benefits roughly a thousand more times, he drops the pricing bomb. Regular $6,000, but yours today for only $1,999 (or five payments of $599). Then an offer pops up on the side and a clock starts ticking down from an hour. Here’s another reason to love WebinarJam: limited-time offers & CTAs. It’s no secret in marketing or psychology that you should offer a deal at the end of your webinar for people to action on. Even if $1,999 is more of a permanent discount than a limited-time offer, come up with something that makes everyone feel good. Remember: it’s never about the deal you got—it’s about the deal you think you got. I mentioned earlier that the Sam Ovens funnel is a complete loop. The link goes to the registration page again, and then you’re back to where you started. I’m actually surprised this is the only follow up, aside from some remarketing. I’ve gotten more emails from him since, but they didn’t have anything to do with the webinar directly. If anything, I’d suggest reviewing this part of the funnel closer depending on what you sell and coming up with a stronger follow-up plan. Sam’s content is so good that he’s been able to build a name for himself in the consulting space by telling a compelling story, appealing to his audience’s desired future state, and tying it together with a great funnel. Maybe there’s a case of “fake it till you make it” going on behind the scenes (as some have pointed out), but power to him. He’s a man on a mission to share valuable information and make a difference in the lives of consultants. Screw the haters. His success is what happens when you combine good salesmanship with good marketing, and he appears to have earned every penny of whatever he’s actually worth. Hi Devon fantastic article. Will have to try and leverage some of these awesome tactics in my own endeavours. Thanks Devon, this is a really high quality write up. I’ll definitely be checking in on the blog.